We’d love your help. Let us know what’s wrong with this preview of Breakout by Kate Messner. Nora Tucker is looking forward to summer vacation in Wolf Creek--two months of swimming, popsicles, and brushing up on her journalism skills for the school paper. But when two inmates break out of the town's maximum security prison, everything changes. Doors are locked, helicopters fly over the woods, and police patrol the school grounds. Worst of all, everyone is on edge, Nora Tucker is looking forward to summer vacation in Wolf Creek--two months of swimming, popsicles, and brushing up on her journalism skills for the school paper. But when two inmates break out of the town's maximum security prison, everything changes. Doors are locked, helicopters fly over the woods, and police patrol the school grounds. Worst of all, everyone is on edge, and fear brings out the worst in some people Nora has known her whole life. Even if the inmates are caught, she worries that home might never feel the same. Can you please make this book free? Engaging and thought provoking. One of my favorite Kate Messner books, yet! This was one of the most captivating and brilliant books I’ve read in a long time. So I cry a lot when I'm reading books. That wasn't true for this one. But as I reflect on what I've just read and write my review, I am in tears. Breakout is unequivocally in my top 3 for best books ever written for middle-grade readers. In an effort to educate myself on racism and oppression in the United States, I have read a lot of YA fiction (Angie Thomas, Nic Stone, Jason Reynolds are a few that spring to mind) that has tackled the tough topic of racism. I've been waiting for a middle-grade So I cry a lot when I'm reading books. That wasn't true for this one. But as I reflect on what I've just read and write my review, I am in tears. Breakout is unequivocally in my top 3 for best books ever written for middle-grade readers. In an effort to educate myself on racism and oppression in the United States, I have read a lot of YA fiction (Angie Thomas, Nic Stone, Jason Reynolds are a few that spring to mind) that has tackled the tough topic of racism. I've been waiting for a middle-grade book to do that same thing. Some have touched on it, writing books with strong points-of-view from people of color. But, to my knowledge, no one has ever tackled racism from multiple points of view. Kate Messner has done it. What's more, she did it by invoking some of the greatest writers both past and present (Hughes, Woodson, Miranda) and infusing the book with their perspectives and the perspective of Elidee, one of the protagonists. And they way Messner tells the Elidee, Nora, and Lizzie's story is singular: through many different perspectives, from the girls', to journalists, to recordings, and text messages. She did an absolutely MASTERFUL job of weaving prejudice and systemic racism throughout the plot, uncovering it like an onion without ever becoming preachy. And those Hamilton lyrics?! COME ON. Such an exquisite bonus. And you know it's good when my 15 year-old daughter reads the back cover and says, "Can I read this real quick before you send it off?" Thank goodness she's got the night and the morning before the mail goes out and Breakout continues on its #bookexpedition. I will miss it once its gone. It's two weeks before the end of school and the kids in Wolf Creek Middle School in upstate New York are looking forward to summer vacation. This year, however, they have a summer assignment to submit at least 5 items to be put into the Wolf Creek Community Time Capsule to be opened in fifty years. For best friends and lifetime residents of Wolf Creek Nora Tucker and Lizzie Bruno, the assignment is pretty interesting. Nora's father is the superintendent town's maximum security prison, and Lizzie It's two weeks before the end of school and the kids in Wolf Creek Middle School in upstate New York are looking forward to summer vacation. This year, however, they have a summer assignment to submit at least 5 items to be put into the Wolf Creek Community Time Capsule to be opened in fifty years. For best friends and lifetime residents of Wolf Creek Nora Tucker and Lizzie Bruno, the assignment is pretty interesting. Nora's father is the superintendent town's maximum security prison, and Lizzie's grandmother works in the prison kitchen. But for Elidee Jones it's a very different story - she and her mother have just moved to Wolf Creek from New York City, a decision made when Elidee didn't get into the elite charter school she had applied to and since her brother is incarcerated in the prison, the move would make visiting him a lot easier. Nora and Lizzie are curious about Elidee, but find her to be unfriendly at first. Nora is also upset because she used to be the fastest runner in gym class, and Elidee beat her timing by 30 seconds running a mile. But no sooner does Elidee begin school in Wolf Creek then two inmates escape from the prison and everything comes to a halt. People are told to lay low at home while an intense manhunt begins. Lizzie's grandmother is in the hospital so she's staying at Nora's and the two girls can't wait to get out of the house to find out what's happening. At home, Elidee writes letters to her brother Troy and begins to explore her own creative voice through poetry, influenced by Lin-Manuel Miranda's Hamilton, a play she saw with her NYC class just before moving. As the days go by and the inmates aren't caught, the kids return to school and slowly Nora, Lizzie and Elidee form a tentative friendship. But the manhunt, the presence of reporters in town, the stress of thinking the two escapees might be everywhere and anywhere in or around Wolf Creek begins to crack open the friendly façade of the town's residents. Soon, Elidee is noticing racially based comments, behaviors, and microaggressions at school and in town, and experiments with recording her anger in different poetic forms. But Nora is also becoming aware that her beloved Wolf Creek isn't the warm, welcoming place she always thought it was, as she notices how people, including her mother, have an unconscious racism that makes them see Elidee not as a middle school kid, but as a racial stereotype. Thanks to her older brother, however, Nora also begins to understand some of the ways that systemic racism plays out in communities and especially disproportionate number of incarcerations of African Americans, as well as other social injustices faced by people of color in this country. And Lizzie, well, she learns what it means to have a family member incarcerated when it comes out that the escape was an inside job. Told through variety of methods - letters, text messages, poetry, recorded conversations, new reports, even comics, and by various people beside Nora, Lizzie and Elidee - Breakout is based on a real prison escape (and being a New Yorker, one that I remember quite well). Elidee's presence and the breakout aren't the main storyline, but really the catalyst that brings out people's true feelings about race and racial profiling. Once they see this happening, it is up to Nora and Lizzie to figure who their own authentic selves are and not Elidee's job to teach them or change them. Elidee's presence in the story is to find her own authentic voice as a poet for expressing her feelings about what she experiences. Breakout is a fast read, but we get to know the main characters so well. I loved watching Elidee's growth as a poet, Nora growth as an empathic person (who knows what she will do with that) and Lizzie's growth as a journalist. But I really enjoyed seeing Elidee's growth as a poet. I think a lot of people don't realize that copying the style of greats artists is one way to get there. And Elidee has chosen some of the best - Langston Hughes, e.e. cummings, Jacqueline Woodson, Nikki Grimes, and of course Lin Manuel-Miranda. Interestingly, we never really discover why Elidee's brother is in prison and we don't need to know. Breakout is a timely book and one that should be on every middle grade classroom, and every middle grade library. Nora and Lizzie are enjoying the end of the school year in their small, east coast town, waiting for field day and all of the leisure of summer. When two prisoners break out of the local prison (for which most of the local residents work), things become tense. Nora's young brother becomes obsessed with trying to catch the "bad guys" before his birthday party, and reporters and search teams take over the town. For a summer project, the students have been assigned to write five letters for a town time capsule, and Nora and Lizzie throw themselves into the project, reporting on all of the events. They are joined by a new girl, Elidee, who has moved to town with her family because her brother is serving 15 years in the prison and they want to be able to visit and check on him. Since Elidee is black, and there is only one other black student in their grade, she feels awkward and spends a lot of her time writing poetry in the style of Jacqueline Woodson and other authors. As the search continues and tensions rise, field day is canceled. Lizzie's grandmother is arrested on suspicion of helping the two inmates. A local festival and 5k run still takes place after school is out, but the suspects are cited during it, people are pulled off the streets and sheltered in public buildings. Told through articles, letters, texts and photographs, Breakout chronicles three girls' interpretations of a particular event (based on an actual occurrence in Messner's area), and shows how the town learns lessons about perceptions, principles, and prejudices. Strengths: I always adore Messner's work, and it was interesting to see how she fictionalized one of her own experiences in this innovative format, which is reminiscent of Holm's Middle School Is Worse Than Meatloaf: A Year Told Through Stuff (2006). Students being involved in current events and having interests like writing always makes for a great story. The bibliography at the back has a lot of good book suggestions for further reading-- you can take the English teacher out of the classroom, but I'm glad that the classroom has never fully left Ms. Messner! Weaknesses: The problems with racial profiling and the difficulties that people of color face today are timely and touched upon in a helpful fashion, but a bit lost among all of the other things going on in the book. I was so impressed with this! It’s huge but easy to read (the texts and cartoons helped it stay fast-paced) and it is a great introduction (especially for white kids) to some big ideas about injustice. Give this to your little activists and watch them fall crazy in love with this book. 4.5 -- LOVED this story and the different pieces of writing used to tell it. This also got me down a rabbit hole researching the actual prison outbreak from 2015 and those from Alcatraz! Just finished reading this again with a 7th & 8th grade book club. Excellent material for discussions about racism and unfair assumptions, and the kids really enjoyed the unique format. I really enjoyed this story of what happens to a small town when two inmates from a local prison escape. Fear can help a community come together, but it can also bring out the worst in people. Told through multiple narrators' artifacts for a time capsule, this book sheds lights on important issues like syst Just finished reading this again with a 7th & 8th grade book club. Excellent material for discussions about racism and unfair assumptions, and the kids really enjoyed the unique format. Just my opinion, and I mean no disrespect. I’m a big fan of Kate’s books and I know she worked hard on this one and did a lot of research but it just didn’t work for me. I think this would’ve worked better as narrative non-fiction or even historical fiction since the story did closely mirror the breakout event. I thought the racism pieces were very didactic and felt like a forced lesson for readers, rather than a natural unfolding of the story. This quote stood out to me as I read Breakout by Kate Messner. Nora Tucker and Lizzie Bruno immediately introduce Wolf Creek as a happy, friendly, and welcoming little town, but so many rules are put into place when two inmates break out of Wolf Creek Correctional Facility. Does Elidee Jones see Wolf Creek as the happy and welcoming town that everyone says it is? Nora says that she is tired of living without freedom. Do we even live with freedom in our society? What does freedom look like for everyone? When I opened the first page of Breakout and saw the hybrid version of writing that Kate Messner chose, I was very excited to begin a different type of book than I was used to. I have read a lot of Kate Messner’s books, and I was particularly excited about this one. I found Breakout to be different from many of her books that I have read. First of all, I was not used to her writing about social issues. I have read many books that tackle social issues head-on, but this book was very different. I found it to be just addressing the issue, not giving the reader questions about how to solve it. I also found it to be very dragged out. These were some of the reasons why I would only give it two stars. There are three main perspectives from which the book is written. Nora Tucker, who has been a resident of Wolf Creek for her whole life and is white, Lizzie Bruno, who is Nora’s best friend and also white, and Elidee Jones, who just moved to Wolf Creek, and is a person of color. These three narrators offer different perspectives, and that is something that I really enjoyed. All three protagonists chose different way to narrate the story. Elidee wrote poems and letters to her brother, Nora wrote letters for the time capsule, and Lizzie recorded conversations and wrote satire. Watching the story unfold through the lens of these three girls is something that I really appreciated about this book. As for the plot, I found it to be pretty dragged out. The majority of the story was illustrating the town during the inmates’ escape, which got boring after a while. I wish that Kate Messner would have included more about Elidee, and the discrimination she received as a person of color in Wolf Creek’s society. Only three instances come to mind when I think about the book addressing race as a social issue. The first being when Elidee and her mom come to the ham supper, and Mrs. Jablonski dismisses their desire to help out (Messner 193-196). Another instance is when the search for the inmates is in full swing. During this time two officers see Mr. Washington (the only other person of color in Wolf Creek) running in the woods, and they immediately assume he is one of the inmates (Messner 275). The final instance is at Nora’s house, when Sean asks his dad about the racial diversity of the prison workers (Messner 77-79). Mr. Tucker gets very defensive and doesn’t answer the question directly. All three of these scenarios have the ability to propose a bigger discussion or teaching about race; however, none of them spark that conversation. That discussion and teaching is a big thing that this book lacks. This book is kind-of, sort-of loosely based on a true story - the escape of 2 inmates from Clinton Correctional Facility in upstate New York in 2015, not far from the author's home. I like how she takes a real-life event and makes it accessible for children. She is able to capture the irritation of all of the children who are missing out on outdoor fun as the troopers search for the escapees, and the fear of her younger brother who has trouble going to bed without all the possible hiding places being checked. Yet, she does all this is a way that isn't the kids doing all of the work and finding the bad guys and being the heroes. She also addresses some racial injustices which are often seen in a small town which is lacking diversity, and I think this is important for children to begin paying attention to, even at a young age. There are a lot of interesting middle grade books out there about prisons - All Rise for the Honorable Perry T. Cook is one of them - that takes a hard look at the issue and how it affects kids. Breakout is slightly different. There is a main character, Elidee, who moves to Wolf Creek to be closer to her incarcerated older brother. But for the most part, this is a book about a small town where most of the income comes from the prison, and what happens when two inmates escape. I've enjoyed Messner There are a lot of interesting middle grade books out there about prisons - All Rise for the Honorable Perry T. Cook is one of them - that takes a hard look at the issue and how it affects kids. Breakout is slightly different. There is a main character, Elidee, who moves to Wolf Creek to be closer to her incarcerated older brother. But for the most part, this is a book about a small town where most of the income comes from the prison, and what happens when two inmates escape. I've enjoyed Messner's books in the past, but I had a difficult time with this one. Maybe it's because most of the novel revolves around Nora, a blissfully unaware middle schooler whose father runs the prison. As far as Nora's concerned, racism doesn't even really exist - that is, until Elidee (who is African American) moves to town, and Nora starts noticing how differently people, including her own mother, treats her. Some of my reservations stemmed from the mixed media aspect of this book - I don't get as emotionally attached to books told through various mediums, and that was the case here. I also felt that this was less a story about inequality and hard truths, and more about a white tween's journey to social consciousness. Both stories are valid, but I was expecting the former, not the latter. I also found Elidee's ending problematic. Logistically, it made no sense to me. No spoilers, but I don't know if this would actually happen in real life. If you want an introduction to Kate Messner's work, I highly recommend All the Answers or The Seventh Wish. The Seventh Wish in particular, is a gentle, yet unflinching look at family issues. For me, Breakout just didn't have the same amount of impact. Forget about a coming-of-age story, this was a becoming “woke” story. When you see the words “white privilege” and “racial profiling” in a middle grade book, you know that lessons are in the making. Messner presents important and provocative issues in a way that invites reflection and discussion at a level appropriate for younger readers. When two prisoners, one black and one white, break out of the local prison, the small town of Wolf Creek shows cracks in its identity as a “friendly, welcoming” Forget about a coming-of-age story, this was a becoming “woke” story. When you see the words “white privilege” and “racial profiling” in a middle grade book, you know that lessons are in the making. Messner presents important and provocative issues in a way that invites reflection and discussion at a level appropriate for younger readers. When two prisoners, one black and one white, break out of the local prison, the small town of Wolf Creek shows cracks in its identity as a “friendly, welcoming” place. These cracks are captured in the documents that three sixth grade girls are preparing for a time capsule project. Newcomer Elidee, whose brother is in the prison, experiences subtle and blatant acts of racism from all directions. Her anger and frustration spill out into poems and raps inspired by her literary heroes. Nora, daughter of the prison superintendent, finds data about the demographics of the prison population and the guards, and questions her dad about it. Comic relief comes in the form of satirical articles written by Lizzie reporting on the various aspects of the escape and manhunt. As I read, I would be laughing out loud at Lizzie’s parodies, then hurting for Elidee at each new slight, then cringing with Nora as her eyes were opened to the racism around her. I added an extra star for all of the Lin-Manuel Miranda and Hamilton references. Elidee’s raps, inspired by those in the Broadway show, greatly enhanced the reading experience for me. 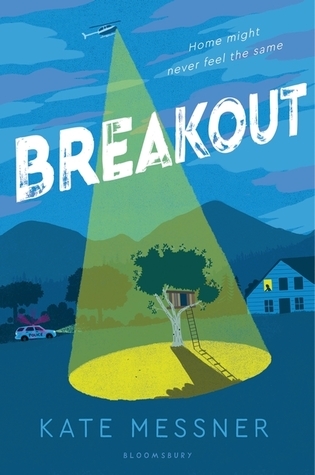 “Breakout” by Kate Messner, is a very unique book compared to almost every other book. It is so special in the way it is written. Kate Messner does a great job or writing the book in the form of letters, newspapers, and poems. There are a few main characters who the letters and poems are written by which gives the book many perspectives on the issues in it. In the book, for the first time in history, in the town of Wolf Creek, 2 convicts have escaped from the maximum security prison leaving e “Breakout” by Kate Messner, is a very unique book compared to almost every other book. It is so special in the way it is written. Kate Messner does a great job or writing the book in the form of letters, newspapers, and poems. In the book, for the first time in history, in the town of Wolf Creek, 2 convicts have escaped from the maximum security prison leaving everyone on alert. The main character Noah Tucker, is a curious journalist who’s inquisitive personality leads her to get hooked in the search for the inmates. When a new girl arrives, people discover that her brother is in the prison and treat her poorly. Thanks to the way Kate Messner composes the book, we get to know both sides of the story and get to figure out what actually happens. Loved the way the story unfolded with the style of writing - texts, articles, letters. Knowing the real events this story was based on was interesting. I can’t imagine the truth depth of those who lived it. Definitely 4.5 stars! I like the varied format of text in the book and I LOVED the references to Hamilton (Lin-Manuel Miranda), Jaqueline Woodson, and Nikki Grimes. Looking forward to book-talking this one. Lots of discussion points: multiple perspectives, variety of text types, fast-paced plot, thought-provoking focus on current issues. Upstate New York small town; state prison a major employer. Middle school, winding down the school year. English teacher assigns 5 letters to future residents to be put in a community time capsule. Nora Tucker, the prison superintendent's daughter, and her best friend, Lizzie Bruno, are planning end-of-school and summer activities. Elidee Jones, whose brother is a new inmate in the prison, moves to town with her mom. Shortly before the end of school, two inmates break out of the prison. In subse Upstate New York small town; state prison a major employer. Middle school, winding down the school year. English teacher assigns 5 letters to future residents to be put in a community time capsule. Nora Tucker, the prison superintendent's daughter, and her best friend, Lizzie Bruno, are planning end-of-school and summer activities. Elidee Jones, whose brother is a new inmate in the prison, moves to town with her mom. Shortly before the end of school, two inmates break out of the prison. In subsequent days, outdoor activities (Field Day!) are canceled and people have to stay inside as dozens and then hundreds of police are searching the area. As the days pass, relationships in the town fray. Nora and Lizzie invite Elidee to join their relay team for Fourth of July celebrations and grow a sort of friendship. Nora becomes aware of racism in the town and even in her mother. Finally, the inmates are caught, in large part because of the girls' research. Elidee and her mom move back to the city. What an amazing story. The authors note at the end helped to understand why a prison break, which is helpful! There is so much to be discussed in the story with children that I am real excited to bring into my classroom. As a teacher, I love all of the different styles of writing. A favorite of Kate’s for sure! Must have 2018 story!